On February 7th, I had the privilege of offering a mass for my mother, Magdalene Namatovu. Below is the homily I gave in her honor at the Geddes Hall Chapel on Notre Dame campus. Mother was loved by God. And Mother loved God. Therefore, mother lives and lives on. For as Jesus tells Martha “Anyone who is loved by God lives, even if she dies.” Whoever believes, which is to say–whoever loves God–will never die. We are grateful for mom’s life, for her love, and most significantly for God’s love for her, and for how that love was shared with us in so many wonderful ways. We gather to celebrate and remember that love. We do so with gratitude for the life of resurrection that mom now shares. If mom enjoys the life of resurrection now, it is because even here, she already shared in that resurrection. She lived already resurrected. Mom’s life was not easy. I am all the more grateful for the resurrection and the hope with which it was filled – a hope that was manifested through mom’s radiant joy, warm friendship, her determination and her selfless dedication for the well-being of her family. Much of this hope grew out of her firm but undramatic faith. She grew up in a staunch Catholic family. Her father, Achilleo, the chief of Nkulungwe was one of the first Catholics in this part of Rwanda, and his dad had given the land on which the Catholic mission of Rwaza was built. Mom was baptized a week after she was born, receiving the name Magdalene – after the Mary of Magdala (who, witnessed the crucifixion, burial and resurrection according to John). The original meaning of Magdala is “tower”. This would become true of this Magdalene’s life as she became a “tower” of love, care and selfless service, already at a young age. For even though mom’s early years were spent in this protected environment and with all the trappings of a Catholic chief’s family, it would soon take a dramatic turn when, at the age of 14, mom’s mother, Anna, died. The first born of her family, mother was taken out of school, to look after her six younger siblings. Thus began her journey of heightened responsibility. Mom’s life took another dramatic turn, when one young man named Anthony, one of the many people working on Achilleo’s estate, asked for her hand in marriage. As mother would tell the story, at first she thought this was a joke. Anthony was not only from a poor background, he was much older, and most importantly he was not a Christian. Anthony said that there was not much he could do about his age. But about being poor, he assured her that he could go to Uganda and work (the British had set up coffee plantations in Uganda, and these were the years of the coffee boom) and there he could earn money to buy the cows needed for the dowry. About his not being a Christian, he wanted to know what he needed to do to become one. He was not only read to become Catholic, mostly importantly, he assured her that he would love and take care of her for the rest of her life. The love won her over, but not without Achilleo’s encouragement, and the intervention of the missionaries! A story for another time. As soon as they got married, Anthony, my dad, decided to bring his bride to Uganda, much to the chagrin of mom’s family. The transition was hard particularly for mother. She had grown up in a chief’s family, now they had to start literally from nothing, in a foreign land. Through a lot of hard work, they established themselves, and built up their home. A number of things kept them going. First, their love for each other (growing up I remember witnessing something like an ongoing romance between mom and dad every evening…); Secondly, it was their faith (every Sunday, walking 7 miles to the mission for mass; As we kids, we were raised at the intersection of mother’s settled Catholicism, and dad’s evangelical fervor of a newly converted Catholic ). The third gift that kept them going, I think, are the blessings that they received in this new place: first the gift of 7 children; and then the gift of warm friendships. Mom and dad’s house soon became a hub for many goings and coming. Every year, around Easter or Christmas, they hosted the entire village at our home. But then in 1972, dad unexpectedly passed. Mother not only became a young widow, but a single parent, left with the unenviable task of raising seven kids. I was 12, and in grade 5. This was during the very difficult and turbulent years of the Idi Amin dictatorship. Somehow, through her hard work, incredible resourcefulness and tough love, mother not only managed to keep our family together, but to raise us, and send us to school, with the help of many friends. Two of us, my older brother Joseph, and then me, would end up joining the seminary and eventually becoming priests. In the 1980s mother’s life took another dramatic and painful turn, when her home was attacked and ransacked. She herself narrowly survived being killed by the rebels. She was to spend seven painful years of ‘exile’ living in the city (Kampala) until 1987, when she returned to Malube, after the rebels took over power, to start rebuilding her destroyed home. In 2003, she was diagnosed with lupus, a condition that she had till her passing, which resulted in a lot of joint pain, and left her–in her later years–unable to walk. Throughout this time however, mother’s zest for life, her joy and generous spirit never waned. Neither did her sense of humor and sense of gratitude! I could go on and on… These are some of the events that marked mom’s life, events through which God’s love, protection and providence were not only manifested, but generously shared with us–her children, grandchildren, neighbors and friends. If you did not know mother’s story, you would not tell for her warm hospitality, cheerfulness and generosity the personal challenges she went through. We are grateful for her life, for her love, and the glimpses of “resurrection” that shone through her life, in the midst of so many challenges. As a family we are particularly grateful that she has indeed been Magdalene: a “tower” of love, care and stability all these years. We are also grateful that on December 27th, ten days before her passing, we all gathered: her remaining five children, her more than 50 grand and great grandchildren, and family friends to celebrate her life. We had mass in her honor, sang and danced for her, and gave her gifts. In what we now recognize as her farewell to us, she was full of joy, as she embra,ed and blessed each one of us. “Alive or dead, we belong to God,” St. Paul reminds us. In her life here on earth and, even now, mom belongs to God. And for this we are extremely grateful, and with much love and gratitude, offer her life back to God. Below are some photos from a farewell gathering with my mother on December 27th, 2018. The Tablet, a Catholic, British magazine, recently published an article titled “50 Minds that Matter.” I am honoured to share that my name was on that list! I hope that you are enjoying this season of preparation and reflection as we await the Joys of Christmas. We here at Bethany Land Institute are reflecting on the genuine goodness of God, and how He has opened so many new partnerships for us this year. We are pleased to announce that through two generous grants, we have secured funding for much of Phase I of our construction, allowing us to break ground in 2019 for two dormitories and classrooms. This will enable us to open our doors to our first cohort of students in 2020, and target our formal launch in 2021. We wish to thank each of you for your continued support for the vision and mission of BLI. We are especially thankful for the funding that you provide for the staff, who have been working tirelessly this year to prepare the campus. They have made tremendous progress, including cultivation of the land, which not only produces all of their food, but with enough extra to sell to the local community. 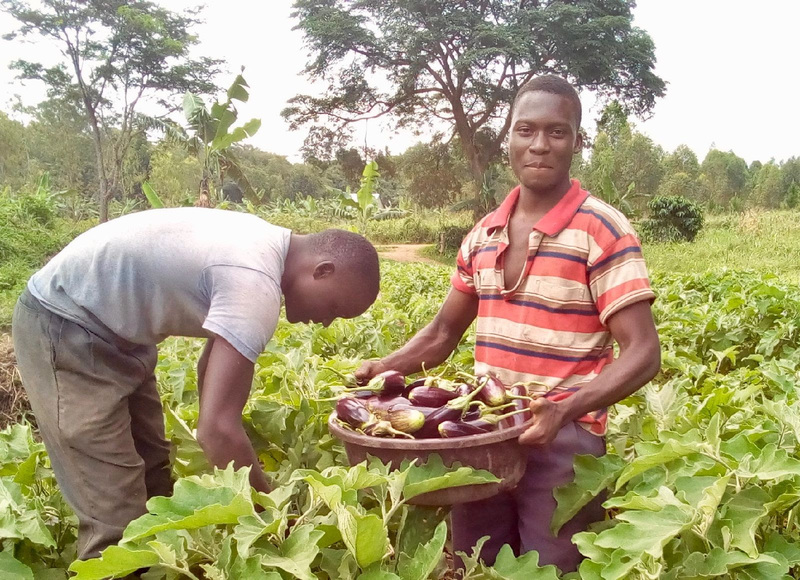 With their proceeds from those sales, they have started the Savings and Credit Co-op, which will allow them to eventually purchase their own farms. In addition, they have planted and dispersed to the local area over 5000 trees on the mission to reforest the land. I invite you to visit our updated website to see photos of their progress. I also had the privilege this fall of being interviewed by Near and Far, a world Catholicism podcast, about our vision for Bethany Land Institute. If you would like to listen, here is the link: https://soundcloud.com/user-597480973/putting-laudato-si-into-action-in-uganda. We look forward to the deepening work of BLI in the coming year, and value your partnership and support to continue our mission. You may make an online donation through our website www.bethanylandinstitute.org or send a check to the address below. If you would like to speak with our Development Coordinator about ways that you can make an impact at BLI, please reach out to her at the contact number below, or through our website. The following report, to be presented at the ATS Luce Fellowship meeting in Pittsburg early next month, offers a good overview of the research project. Earlier this year David Tanghou Ngong, a professor at Stillman College published a review of my book Born from Lament: The Theology of Politics and Hope in Africa in Reading Religion, a publication of the American Academy of Religion. I appreciate his assessment of my work, which not only highlights the strengths of the book but also offers constructive critique. Katongole’s portrayal of an alternative vision of peace which the Christian faith provides in the context of the violent politics of the nation-state continues to be one of his significant contributions to African theology. Perhaps he is right that African theology has been too reticent in pointing out the salutary alternative visions of peaceful life that some Christians in the continent are cultivating. However, his claim that there has been a loss of lament in African theology is not an adequate description of the African Christian theological scene. Lament is at the heart of the theologies of inculturation, Black liberation theology in South Africa, the theology of reconstruction, and African women’s theology: the lament of the various forms of loss many have suffered and continue to suffer on the continent…This notwithstanding, Born from Lament provides significant ethnographic, biblical, and theological material that may enhance peacebuilding around the world.